Looking a nice refrigerator under Rs. 10000? You are at the right place. We have compiled a list of top 8 best refrigerators priced below 10000 available in India as of March 2019. We have covered fridges from brands like Haier, Whirlpool, Godrej, and Samsung. These brands have a good presence in India and provide good after-sales services. All these refrigerators are available on Amazon and Flipkart. Price and stock keep changing so please check the current price, availability and offers on links provided. The capacity of refrigerators on this list is under 200L. It is common to get a refrigerator of around 170-190L at a price of around 10000. If you need a bigger fridge, check out our list of best refrigerators under 15000 and 20000. An important thing to note in below list is the availability of inbuilt stabilizer. All refrigerators don't come with an inbuilt stabilizer so we have listed clearly whether the refrigerator has an inbuilt stabilizer or you will need to buy a stabilizer. This is important because if you are on a tight budget and want to spend around Rs. 10000 then you should go with a refrigerator which comes with a stabilizer. Below you will find a list of refrigerators with a brief review, specifications, and pros cons. Buy links from Flipkart and Amazon are also provided. Let's take a look at the top 8 best refrigerators priced below 10000. Whirlpool has been one of the best brands in refrigerators from last 2 decades. They have been producing fridges with top-notch quality and performance. Even at a price of 10000, you will see that Whirlpool has provided good build quality and the fridge is very durable. Plus, you get some nice features as well. Let's go over them. The first feature is 6th sense QuickChill Technology which helps in retaining the cool temperature for up to 9 hours when the power goes off, so you can get a chilled beverage even when the power cuts off. Second is Easy Manual Defrosting which ensures to provide effective cooling by allowing the refrigerator to defrost easily. The third is the vegetable crisper with Honey Comb Moisture Lock-in Technology which helps to maintain an optimum moisture in your veggies and keeps them fresh for a long duration. The fridge comes with an inbuilt stabilizer and can function optimally within a fluctuation range of 130 - 300 V.
This refrigerator is great when it comes to cooling, build quality and power efficiency. The fridge is a bestseller and is highly rated by thousands of users on Flipkart and Amazon. It is definitely one of the best refrigerators under 10000 to 15000 Rs. This is a beautiful fridge from Samsung and one of the latest models as well. It was launched this year only for Summer season of 2018 and if we go by its looks and specs, we think it will be bestseller this year. Samsung is a well-known brand in the world and one of the best brands in India as well. This refrigerator from Samsung has a beautiful printed design which will look great in your kitchen, Build quality is decent and it has inbuilt stabilizer as well. The capacity is 192L, suitable for a small family. There is an inbuilt stabilizer so no need to spend extra money to buy a stabilizer. You get 1 Year Comprehensive warranty and 10 Years on the Compressor. Samsung has one of the best after-sales service networks so you need not worry about that. These positives make it one of the best refrigerators available in India under Rs 15000 and our favourite as well. This is a value for money refrigerator from Haier. Priced below 10000, it offers a decent capacity of 170L which is suitable for a small family of 2-3 members. The build of the fridge is decent and it feels solid. The cooling is good. It comes with a in built stabilizer which is a plus point as you won't have to spend extra on purchasing a stabilizer. It is 3 star rated and will consume just around 200 units of electricity in a year. 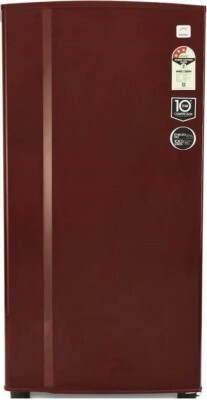 Overall one of the best fridge below 10000 in India. Godrej is a very good brand when it comes to refrigerators. The make some long lasting top quality fridges and this is a similar one. The buiid quality and cooling of refrigerator is great. In around Rs. 10000 you are getting a decent capacity of 185L which is good a small family of 2-3 people. The after sales service of Godrej is good so you won't face any issues there. The major positive about this fridge is that it has an inbuilt stabilizer so you won't have to spend extra money on getting a stabilizer. It is 3 star rated and will consume around 210 units of electricity in an year. So you are good quality and efficiency at a good price. This is a good option from Haier. Priced around Rs.10000, it offers a decent capacity of 181L which is suitable for a family of 2-3 members. The fridge is well built and provides decent cooling. It comes with a in built stabilizer which is a major plus point as you won't have to spend extra on purchasing a stabilizer. Its rating is 3 star and it will consume just around 210 units of electricity in a year. Overall one of the best refrigerator around 10000 in under 200L category. Haier 195L refrigerator is a decent option if you are looking for a fridge at a price of around Rs. 10000 to 12000. The cooling performance of the fridge is good. The design of the fridge looks decent with a metallic finish on the front of the fridge. The material quality is good and the fridge feels durable. It comes with a 4-star rating and consumes less than 200 units of electricity. This Haier fridge allows stabilizer-free operation, thanks to its inbuilt stabilizer. It can operate within the range of 135-290 volts and it eliminates the need for an external stabilizer and protects your fridge from voltage fluctuations. The fridge comes with longer condenser coils and heavy duty PUF insulation. This helps the freezer to produce ice in about an hour. The fridge comes with a fresh room which ensures freshness and coolness. It’s the ideal place to keep green salad and dairy food, like cheese, as they will stay fresher for longer. Overall one of the best options in under 200L fridges priced around Rs. 10000 to 12000. This is a beautiful looking fridge from Whirlpool which is one of the best brands in Refrigerators segment. The floral design on this fridge is eye-catching and will make your kitchen more beautiful. This is one of the latest models from Whirpool and was launched for 2018 summer season. At a price of around Rs. 10000, you get a decent capacity of 185L. The floral design on the front door looks beautiful. The fridge is very solid and provides good cooling. There is an inbuilt stabilizer so you don't have to spend extra money on a stabilizer. It has toughened glass shelves allow you to store large, heavy utensils with ease. Freezer and Ice trays are located in the top section and the veggie box is located at the bottom which controls the amount of moisture to keep the vegetables and fruits fresh for a long time. Go for it if you are looking for a single door whirlpool fridge below 10000 to 12000. 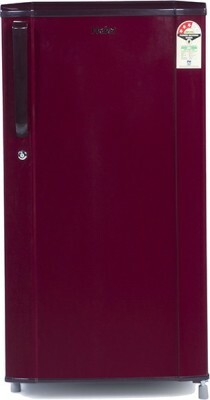 This fridge is available in Wine/Maroon type color which looks really nice with a floral print on it. Godrej refrigerator has a beautiful floral design on the front and comes with a capacity of 196L which is suitable for bachelors and small families. It is a single door fridge with a built-in stabilizer so it can work without any damage when voltage fluctuates. It can operate between the energy-efficient range of 140-260 V.
It is energy efficient with 3 Star rating and supports direct cool technology so it will consume very less electricity. It comes with carbon deodorizer to remove any odor or bad smell from the fridge. This refrigerator has very low noise during operation and has an average user rating of 4.3 on 5 from previous buyers. The fridge is also Environment-Friendly as the CFC, HCFC, and HFC-free fridge does not contribute to the depletion of the ozone layer. The warranty on the refrigerator is 1 year and 10 years on the compressor. It is one of the perfect buys for a budget of under 10000 to 12000 Rs. Our favorite is the Whirlpool 190L Refrigerator. It comes with a nice design, good capacity, and inbuilt stabilizer. Whirlpool is one of the best brands in the refrigerator category and they also have a good after-sales service network. It will cost you little more than 10000 but it is worth it.